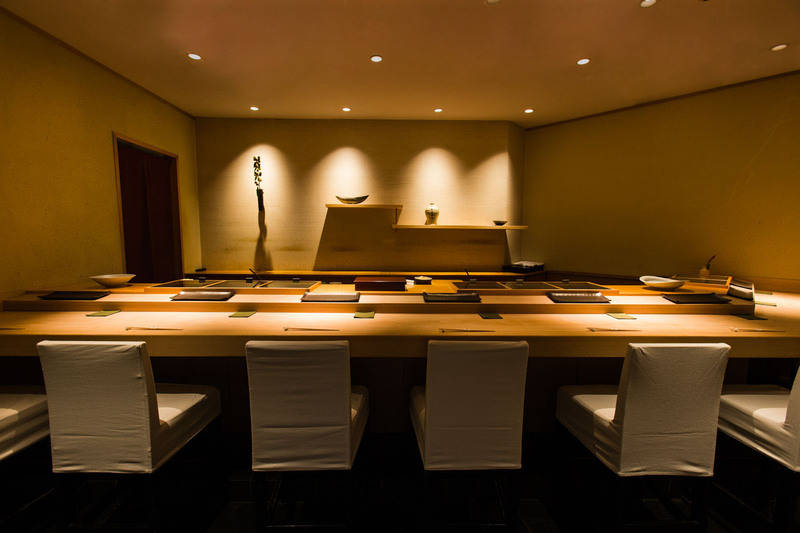 Takumi Shingo offers a night to remember with its lively atmosphere, friendly hospitality and meticulously prepared sushi dishes made from delicacies that the chef himself loves to eat. 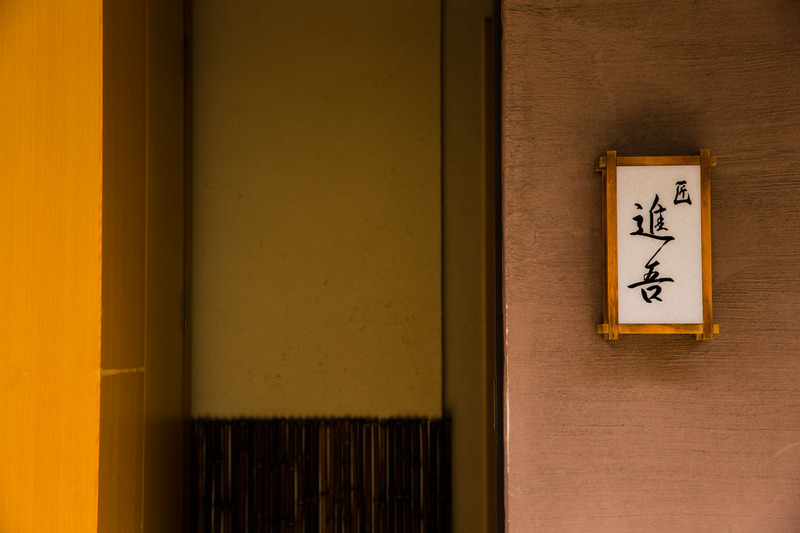 The ‘takumi’ kanji, also read ‘sho’, is a banner for the deep connection with Sushi Sho master Nakazawa, who has passed on everything to this chef. Passion and exquisite ingredients paired with unique insight into the world of sake – a wonderful way to satisfy your sushi appetite. Just a short walk from Aoyama Icchome metro station in the Minami-Aoyama area of Tokyo, a long chestnut stucco wall contains a small alcove with the door into Takumi Shingo. A crescent moon shaped restaurant with an eight-seat counter, the extreme minimalism and high ceiling provide a strong sense of space and relaxed comfort. The light tones of the hinoki counter, ecru seat covers, and subtle colored walls contrast with the dark slate floor and occasional boldly-colored lacquerware box or earthenware bowl. Wall to wall behind the chef are wooden cabinets containing a wealth of goodness from the seas around Japan, and sitting up on the tall chairs, you can see the sushi chef’s gentle hands at work. Enjoy lively atmosphere and friendly hospitality. 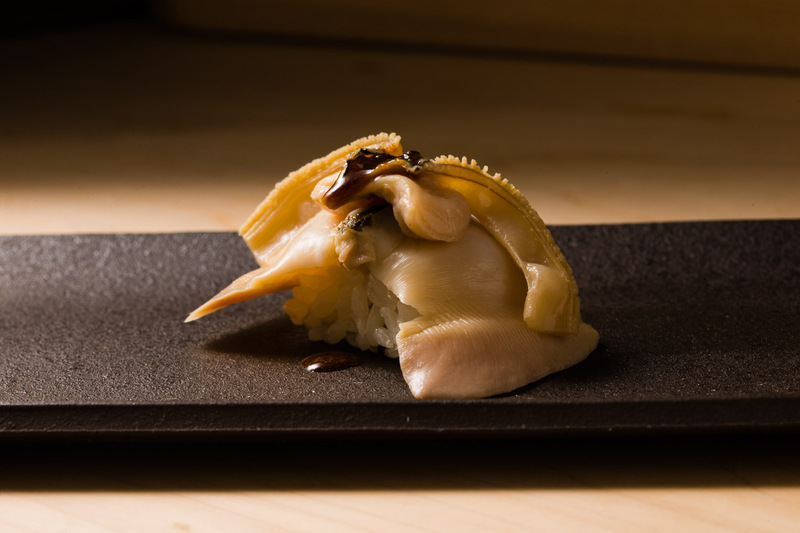 Chef Shingo Takahashi’s cuisine is built on deep-seated sushi traditions and seasonal ingredients, woven together into morsels that the chef himself wants to devour. They include items like miso-marinated Hokkaido Murasaki uni sea urchin, inspired by the food memory from a visit to Nagasaki. 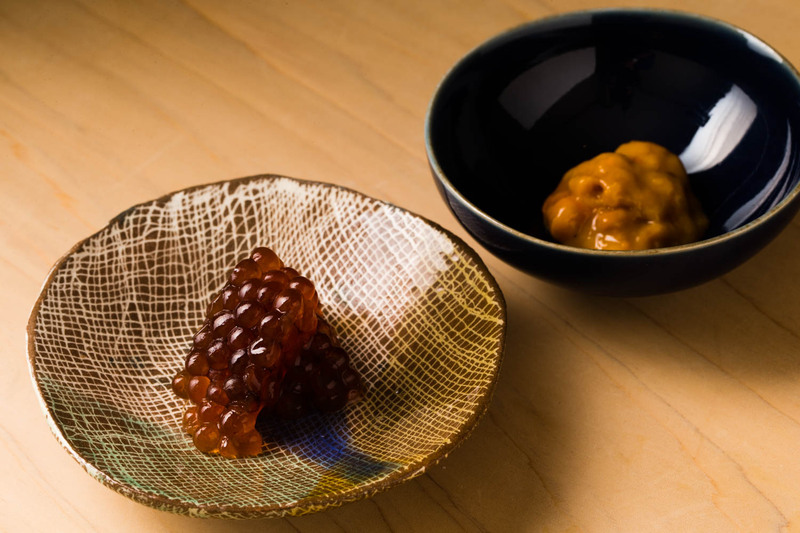 With its appealing mustard yellow hue and sweet taste, it is a perfect match for some cool refreshing sips of sake, as is the miso-marinated trout roe by its side. 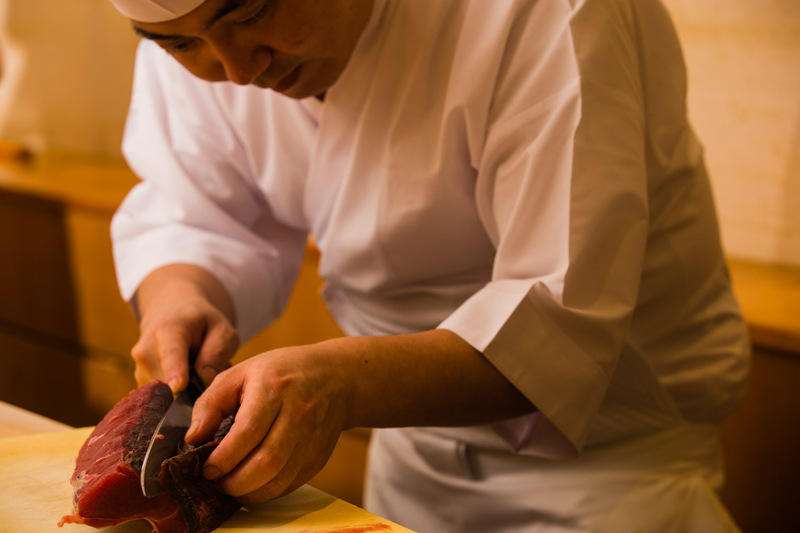 Fastidious about every component that goes into making a sushi dish, even the tableware is carefully examined for the correct placement before topping it with his latest creation. 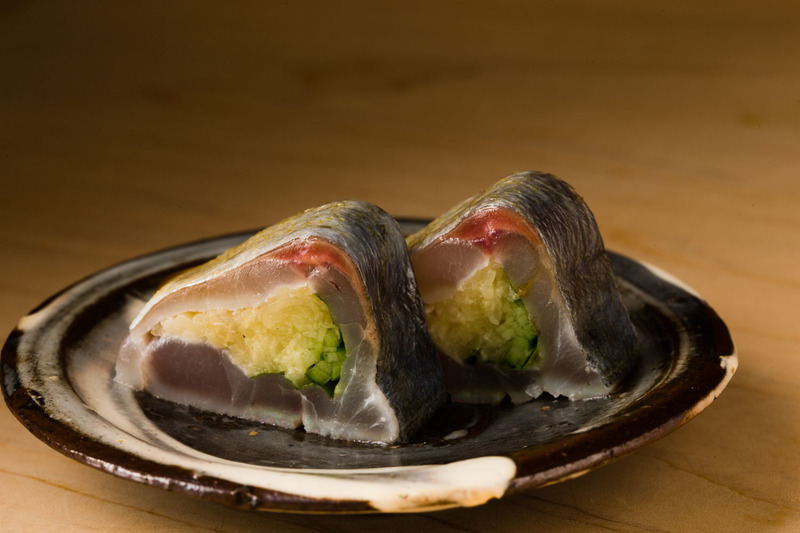 Sawara (Japanese Spanish mackerel) pressed sushi has an earthy aroma, as the skin has been gently flamed over straw. 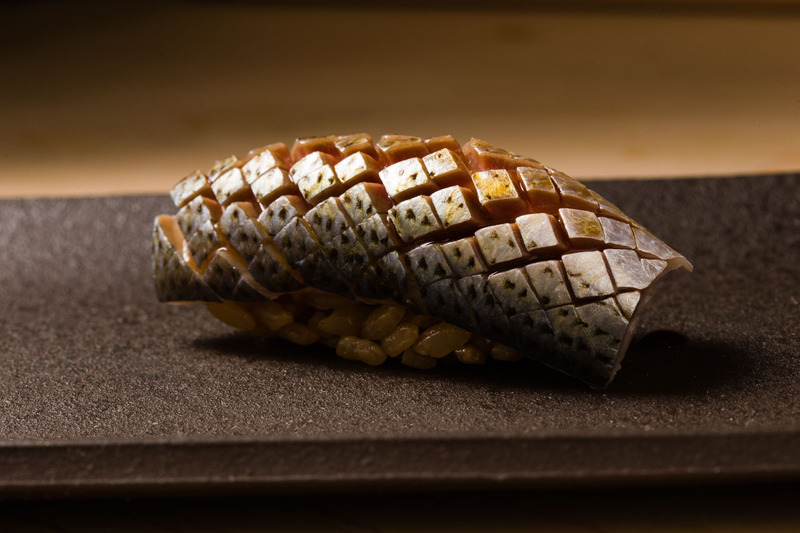 A fleshy piece of vinegar-marinated aji horse mackerel stuffed with cucumber, shiso leaf and pickled ginger, zings with flavor, accented with a tiny drop of soy sauce before serving. 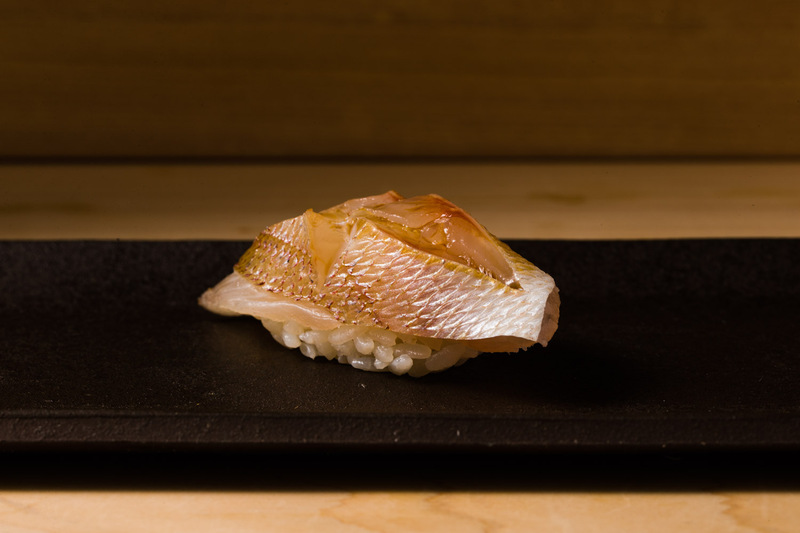 Carefully composed appetizer dishes like this are followed and interspersed with a series of nigiri, such as kelp-cured Kasugodai sea bream with its pinkish skin split open to reveal plump and tender flesh within. 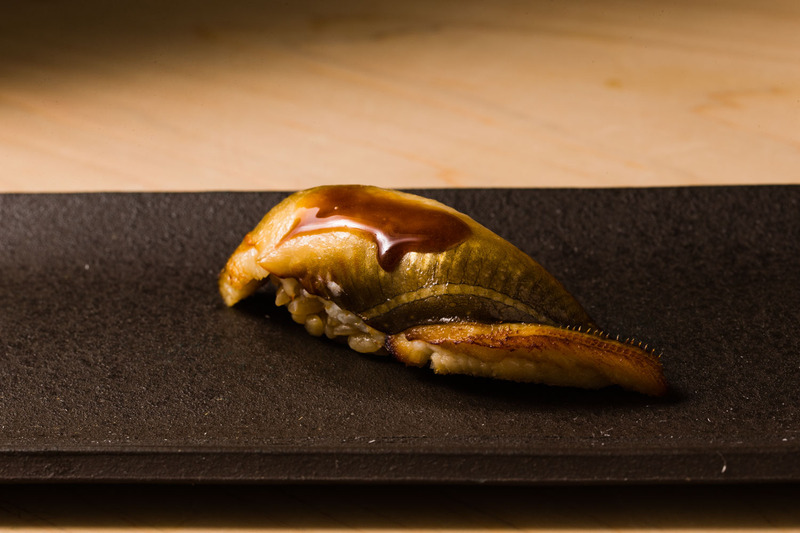 Sensual layers of simmered Hamaguri clam are brushed with a soy sauce reduction, and gently charred anago sea eel takes on a delicious roasted flavor with a sweet aftertaste. A particular favorite of the chef’s, soy sauce is carefully painted on the lustrous skin of a generous slice of kohada gizzard shad that has been scored to make it easier to eat. 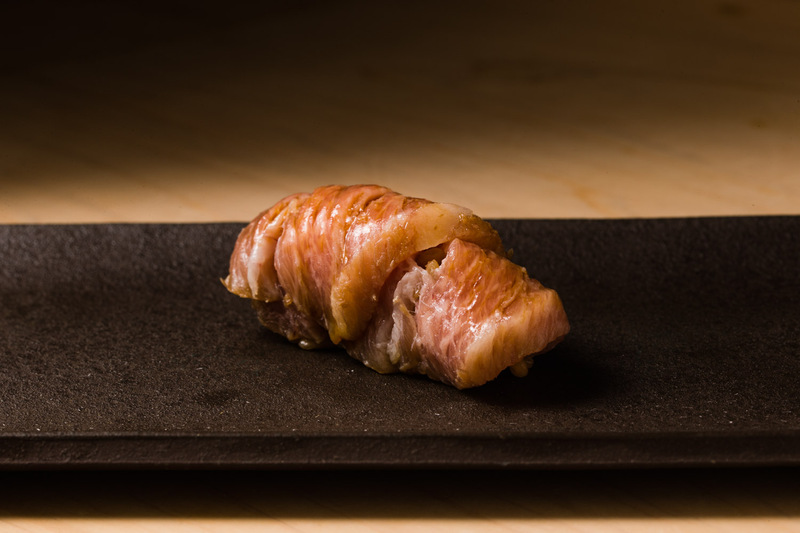 You may be served 10-day-aged fatty tuna with such a deep color that it looks like marbled beef, or bonito with its beautiful combination of sweetness and acidity not found in other fish in the tuna family. Whatever path your sushi course takes, it will be completed with umami-rich omelet containing shima-ebi prawns, followed by a satisfying sweet treat. While the majority of Takumi Shingo’s ingredients come from established suppliers at the markets or direct from fishermen in ports around Japan, Takahashi enjoys exploring the different stands run by fishmongers at Tsukiji Market. His sushi rice changes from time to time to ensure the perfect qualities, and is currently a Koshihikari and Sasanishiki blend mixed by his trusted rice supplier. He uses an array of vinegar products from Mitsukan rice vinegar, to red vinegar and a special product from Yokoi Vinegar Brewing Company in Chiba, which gives his rice that little punch. The surprising edge of flavor is what ultimately brings balance when it all comes together with the delectable fish. Chef Shingo Takahashi stands before you with a peaked white chef’s cap topping his lovely round head. The warm and friendly atmosphere is most certainly the product of the demeanor of this man, who proudly lists smiling as one of his specialties. And given his vast and varied experience, there is almost no topic the chef can not expound on. Shingo Takahashi is originally from inland Ibaraki Prefecture. He left high school early knowing with certainty that he wanted to become a chef, heavily influenced by the television animation series of the late 80s, Mister Ajikko. Originally planning to pursue washoku traditional Japanese cuisine, a fateful introduction to sushi master Chef Keiji Nakazawa of Sushi Sho shifted his aspirations. He very quickly sensed what a serendipitous situation he had been placed in, and that fired his motivation to work extremely hard. His history with Nakazawa spans a total of 18 years, but after 13 years he was sent out to experience other aspects of Japanese cuisine and culture, including working at an izakaya in Fukuoka, waking early with the fishermen in the Goto Islands off Nagasaki, and learning the ins and outs of sake brewing in Miyagi Prefecture. It suited his passion for learning and experiencing with his own hands, eyes and palate; he loves to travel, visit ports, admire tableware, and of course, to eat. After some more time back with his master, Takahashi decided to go independent. Wishing to pay respect to Nakazawa by staying true to his methods and styles, Takahashi recognizes that after five years on his own some of his individual style is starting to color the Takumi Shingo experience. 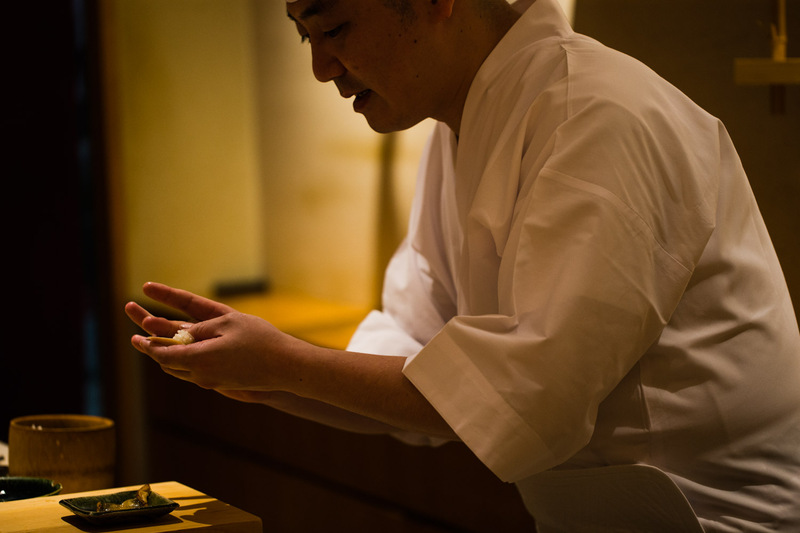 With a serious look on his face, Chef Takahashi talks about the appeal of sushi being not just in the cuisine, but in the people. The sign of a great sushi restaurant is when customers not only want to eat the chef’s sushi, but when they want to see the chef again and partake in everything he puts on the plate and into the experience. 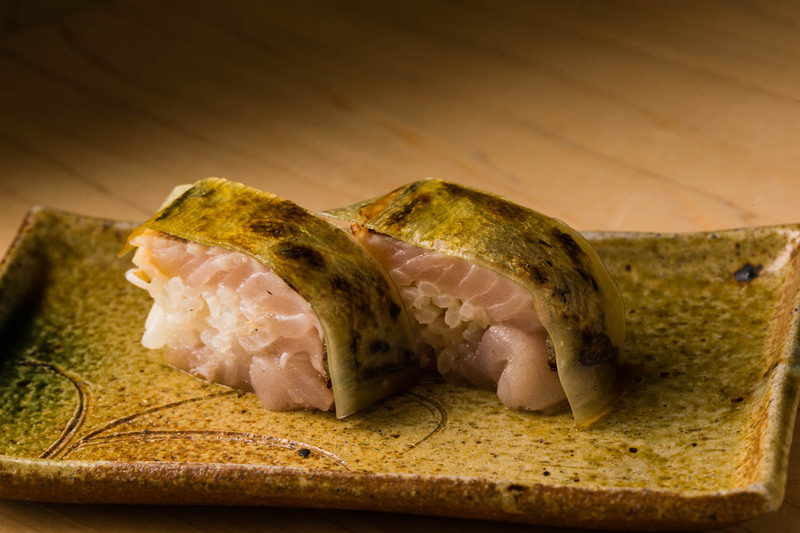 That is the joy for the customer and the ongoing motivation for the chef, and Takahashi feels a very strong obligation to hand that wisdom on to the sushi chefs of the future. 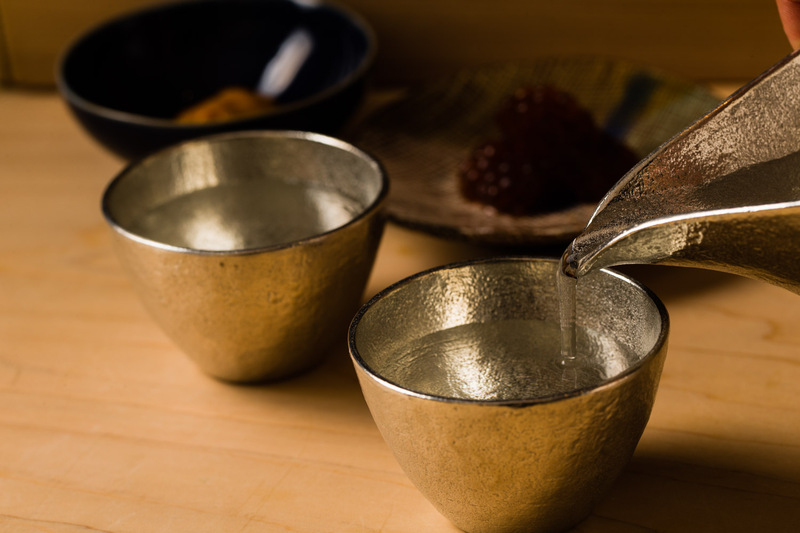 If you are looking to pair sake with your sushi experience, there is no better place than Takumi Shingo. 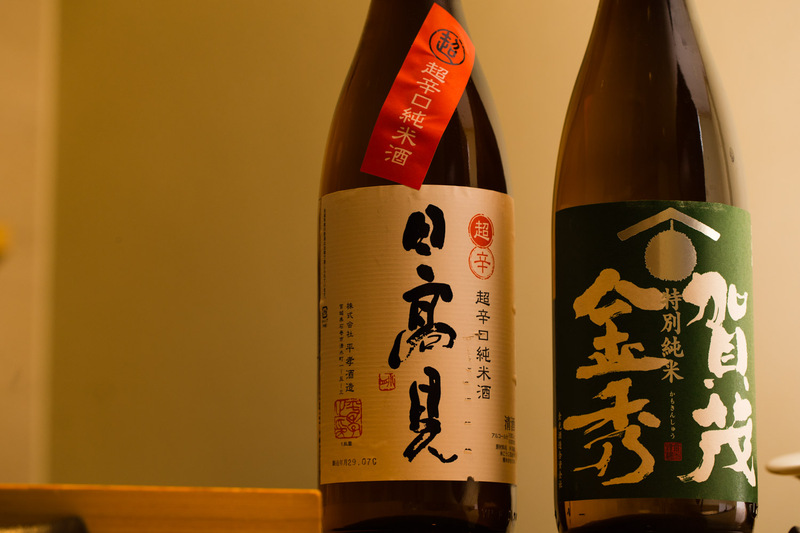 Not only does he have an excellent selection, the chef himself worked in a sake brewery for six months mid-career. Toiling at Hirakou Brewery in Ishinomaki, Miyagi, a town that was devastated by the earthquake and tsunami disaster of 2011, Takahashi gained a new understanding of the hard work and commitment sake-brewing requires, and an appreciation for the subtle differences in flavors.